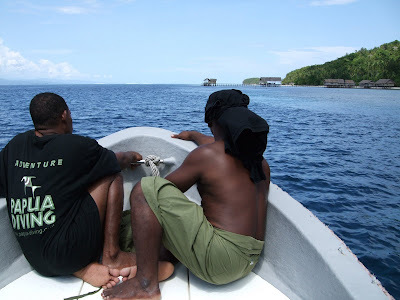 Arriving at Kri Eco Resort on Kri Island (south of Waigeo Island, north of West Papua's Bird's Head (Vogelkop) peninsula, a two-hour speed boat ride from the city of Sorong. Fishes often cruise under the traditional Papuan stilt houses. While brushing your teeth at the window, you will most probably see barracudas and parrot fishes. A bamboo shark seems to like the proximity of the restaurant/kitchen house. We were also regularly greeted by a turtle while having a sundowner on the jetty. The house reef is a great place for snorkeling, featuring beautiful corals and lot's of fish. Conch shell blowing to signal that the boat is ready for the next diving trip. Looks easier than it is. Tapping on a dive tank at the restaurant entrance to signal meal times requires less skills! Bumping Bumpheads. We saw schools of Bumpheads often at various dive sites. Big schools of fish (tuna, jacks, trivallies, barracudas, sweetlips, snappers) are very often seen at places where the current is strong. Some dive sites can be better appreciated if you have a reef hook. Manta ray sightings are guaranteed. On one dive, we saw 3 huge ones and 2 smaller ones at a cleaning station. We had to leave after 70 minutes, but they kept doing their rounds. Dive guide Jeffry is taking a rest on one of the more than 1,500 islands of Raja Ampat after a long encounter with manta rays. Raja Ampat encompasses 40,000 square kilometers of land and sea is claimed to have the richest coral reef biodiversity in the world. Glad to see you are still enjoying life... looks like your travelling non-stop. Sidney, good to learn that you are still around. Hope life is treating you well in the colder places of this world. Let me know when you are in Jakarta. Allbest!